Korea, June 1950. The "Land of the Morning Calm," freed at last from three and a half decades of Japanese colonial oppression, enjoys the fruits of peace and independence. In the southern countryside a small village celebrates its patriarch's sixtieth birthday, marking, according to tradition, his passage into old age. In the ancient captial of Seoul an American military advisor pursues his secret, reluctant Korean lover. And just to the north, just above a strange, arbitrary line called the 38th Parallel, a great army, well trained and equipped with Russian-made tanks, prepares in stealth for what its Communist commanders hope will be a brief and glories war of liberation. "Like a shrimp caught between whales:" so Koreans describe the horrific events that followed. For, seeing their own national interests threatened, the great powers -- the United States, the Soviet Union, and China -- transformed Korea into their bloody and tragic battleground. 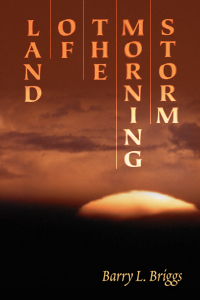 Land of the Morning Storm presents the epic story of women and men great and ordinary, powerful and powerless, Korean and American, caught up in this brutal, frothing maelstrom.